US stocks opened slightly higher on Thursday, pushing the three major indexes farther into record territory. Technology stocks helped to drive the rise, while companies in the industrial sector lagged. The technology-heavy Nasdaq rose 29.29 points, or 0.45%, to 6,563.92. 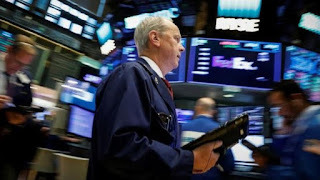 The Dow Jones Industrial Average edged up 9.54 points to 22,671.18 while the wider S&P 500 rose 3.99 points to 2,541.73. Shares in Alphabet and Apple saw some of the biggest increases. Apple, which has been under pressure in recent weeks, climbed almost 1%, while Alphabet gained 0.8% after it released a range of new products, including a new phone and new speakers. The latest economic data showed that the US trade deficit in goods and services narrowed slightly in August to $42.4bn from July's $43.6bn, as exports of goods and services hit the highest level for more than two and a half years.